If realistically you spend $300 a month on gas then you should budget for that. If you only budget $200 you are going to get frustrated on the 20th of every month. That frustration is going to lead to guilt and anger. Which is only going to make you throw your budget out the window. When making your first budget start with what you know. You probably have a good idea of your income, as well as major expenses like your mortgage or rent, car insurance, debt payments, etc. But for a budget to be complete you need more than just the major expenses. You need to know where ALL your money is going. So, for at least a month you should track all your expenses. I personally like collecting receipts because it gives the store, the date, and an itemized list of what I purchased. That way if I don’t get to the receipt right away I will still have the info I need. But you could also keep a notebook if you are able to truly write down everything you spend, or even use Mint.com or The Birdy. If you are going to use a service like Mint then you should check it every day and enter into your budget while it’s still fresh in your mind. If you have a transaction that says “Walmart $50.00” you are going to have to remember what you bought. Was it groceries? Clothes? A movie? Each of those would be a different category, you will want to know how to split it up. The Birdy lets you send a text message right from the point of purchase (or anywhere else). That way you don’t have to keep track of your spending with receipts, it’s a one and done type of thing. Once you know what you are spending you can create your official budget. An Excel spreadsheet with your income at the top and then a list of categories will work. You will want two boxes next to each category. One for budgeted amount, and then one for the actual amount spent. 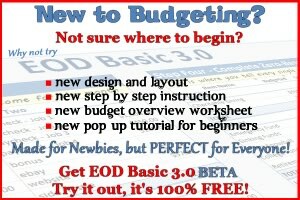 You Need A Budget seems like a really neat tool for those who want a premade, yet customizable, budget. But I’ve never used it myself so I can’t comment. 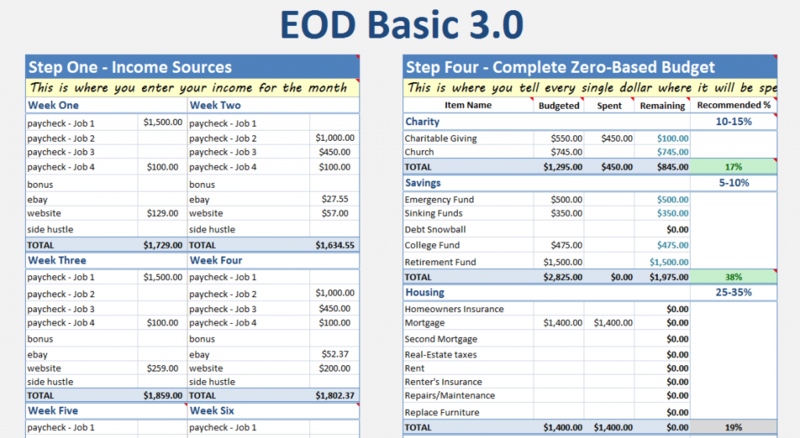 You could also check out Enemy of Debt’s very own EOD Basic 3.0 Excel spreadsheet. It’s customizable and FREE. A budget can be very detailed, or fairly generic, depending on your comfort level. If you are struggling with your spending then you may want to make it more detailed. That way you can see exactly where your money is going. When you can you see where exactly you are spending your money, you will be able to see where you can cut. But on the other hand, if you are meeting your financial goals then the budget can be more generic if you find a detailed budget too tedious. Keep in mind too, having a budget isn’t enough. You must continue to track your spending so you can make sure that your spending is staying in line with your budget. If a category is getting out of whack you can make mid-month adjustments. I would say that this a realistic budget should be everyone’s first step. Making a detailed budget which reflects your current spending is a great starting point. You need to know where you are at before you can figure out where you can make changes. Now the real work begins. If you are covering all your needs and wants and have retired early with more than you could possibly spend in your lifetime, then I guess you’re done. I don’t know anyone in that situation. Normally something is taking up too much of the available income and something else is getting short changed. Cutting back on the stuff normally considered non-essential is the easiest place to begin. Of couse nobody actually needs to go to a movie or drink a $5 coffee. Anyone who’s read a few frugal living blogs knows the standard things to cut out or at least significantly reduce. Once you’ve done all the obvious things, then the choices get tougher. When laying out your budget you probably listed your rent/mortgage, car expenses, utilities as fixed expenses and then quickly moved on to where you expected you could really have some control over your spending. I think considering these as fixed, or necessary expenses is a mistake. Before you consider them unchangeable, give each one serious consideration. Yes you have to pay your rent or mortgage, but are you living in the right place? This isn’t something you’ll change overnight. Is your place to big, or just too expensive for you? It may have made sense at some point, but does it still? Could you get a roommate to reduce the cost, or get a temporary roomie just while you build your emergency fund? Should you move to a smaller place with lower upkeep, utilities and insurance? Assume that NONE of your current expenses are ever written in stone. You may decide it’s still the right choice, but at least give that line on the budget serious thought. Same with the car. First of all, do you actually need one, or is it just easier than the other options, or were all your friends buying cars when they got their first jobs, or did you choose to live where public transportation wasn’t an option? If you must have a vehicle, then consider if what you have is the right vehicle or could you downsize, or could you trade it in on a good older model? Again, maybe what you have is still the right option for now, but think it through. The other budget item that I also think gets too little thought is retirement savings. Virtually everything you read recommends putting aside 10-15% of your income for retirement. Great idea. As a starting point. If you are doing that, you may have mentally checked off that task and consider it taken care of and never give it another moment’s thought. But consider this, what will that 10-15% get you? Normally it’s geared to saving enough to retire at 65. Pause for a moment and think, is that actually what you want? Personally I’d rather not have to work until 65, but that means putting away considerably more than 15% for all the decades before that, which in turn means something else has to give. If retiring at 65 works for you then move on to the next budget line, if you’ve never considered that there are other options, give it some thought now. Now give the income side of the balance sheet serious review. You may have a great job with great pay. Super. If it isn’t enough to get you to where you want to be you have three choices: 1 go back to the spending list and do some more cutting, 2. find additional income, or 3 revise/give up the dream. I’m determined to retire early, so I happily pack a lunch, make my coffee, skip cable and restaurants, buy 3yr old cars and drive them for 10yrs… etc. Allocating significant funds to restaurants, 200 channels and new car smell just aren’t as important to me as working toward early retirement. If they are your priorities, then by all means enjoy – just remember not to complain about schlepping off to work in your 60s. I guess my point is that when people try to get their spending, income and life goals in perfect harmony, too often some of the big budget items get passed over as “fixed” and aren’t put under the microscope. As someone who doesn’t intend to work a minute longer than necessary for my early retirement, I find the recommendation to save 15% hilarious. We all have different interests and objectives, but I fear most people never pause and think long enough to really figure out what’s important in their lives and figure out a way to make that happen. Great comment. Thanks so much for taking the time to write it. I agree with everything you said. There certainly are steps to take once you have a budget. Coming to the realizations you went over in your comment takes a lot of time. I’m sure you didn’t wake up one morning and see all the steps you mentioned. To be honest, I don’t think even I’m to that point in my thinking quite yet. Although we have made huge strides in the past few years. I, like many other of your readers, am a great Dave Ramsey fan. The one thing that took a HUGE amount of pressure off of creating a “perfect” budget is the concept of paying the four walls first: #1 is food, then lights & electricity, mortgage/rent, transportation, clothes. I think what lot of people try to do first is cut the food budget to almost nothing and I would panic near the end of the month wondering if my child and I would be able to eat anything except peanut butter (which he would be 100% ok with.) Once I was “allowed” to put food at the top, I was able to make smarter decisions with the rest of the budget. And you are DEAD ON about knowing where your money actually goes now and then making a budget accordingly. Tracking your receipts for a few months can be a huge wake up call (I’m spending WHAT on eating out?) but is very helpful in budgeting occasional expenses like oil changes, property tax, annual memberships, etc. Also, I love your spreadsheet! I’m going to use parts of it to tweak the one I currently have. Thanks! I’ve tried both ways in creating a budget … over-the-top detailed spreadsheet with percentages, color coding, categories, etc. and a plain old KISS (keep it simple, stupid) spreadsheet. Found out the KISS method worked best for us, but key was deciding what was an absolute NEED vs a WANT. As JMK notes above, it turned out everything for us is a WANT (size of house = size of mortgage, which is because I WANT that type of house). I have to say, coming to that realization surprised us and also liberated us, because then the budget became a matter of managing the money — making it work for us instead of us working for it. Once we had that mindset, it became easier on us. Even when we both ended up losing our jobs! Now we’re back on track with one of us having a job, and our new goal is to pay down the mortgage as fast as we can. So when we want to purchase something we ask if we’d rather put the extra money towards the mortgage instead. Most of the time the mortgage wins! I’ve switched over to using cash for groceries and personal spending. I’m not recording everything in a spreadsheet, but then I have my receipts and pieces of paper listing the totals. Gas, larger spending expenses like clothes come out of checking. I’m trying to save ahead for some larger annual expenses like car registrations, so we have the money ahead of time. What’s tough about my situation is my income and my boyfriend’s income are both variable, which makes planning a budget tough. What doesn’t change is the huge amount we need every month just to get by! Frustrating. Variable income can be tough. The income in our house is variable also. I think having a written budget is even MORE important when you have a variable income because you need to keep an even closer eye on it than someone who knows exactly how much is coming in. What we do is anytime our income is over our monthly budget amount we transfer the extra into a separate savings account that is linked to our checking. Then when our income is less than our budget amount we transfer money back into checking. It helps even out the ups and downs.